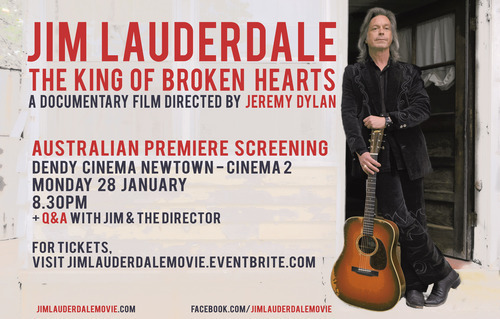 To coincide with Jim’s upcoming trip to perform at the Tamworth Country Music Festival next week, we’re holding the Australian premiere of the film on Monday 28 January at the Dendy Cinema, Newtown. Doors will open at 8.15pm for an 8.30pm kickoff. Jim and I will both be in attendance and will do a Q&A session post-screening. 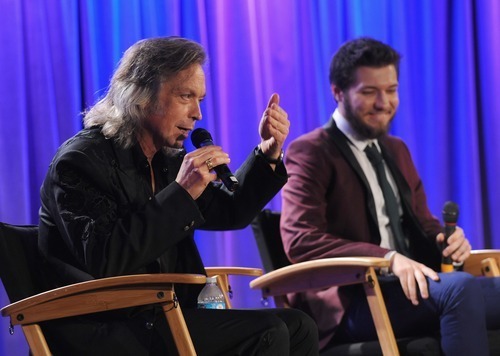 Scott Goldman, VP of the Grammy Foundation and MusiCares, interviews Jim Lauderdale and I after the LA Premiere of the documentary at the Grammy Museum, last Tuesday. Two most noticeable differences between Nashville and LA (aside from the temperament of the drivers) are height and sprawl. Not that Nashville has no skyscrapers (anyone who’s visited will be familiar with the Batman building), but it’s not dominated by dazzling towers affixed with gigantic visages of animated rabbits, vodka and (this week) Gerard Butler. Nashville is basically a larger than usual small town. From the hotel I stayed at downtown, it was no more than fifteen minutes walk in any direction to get me to the Ryman Auditorium, Bridgestone Arena (where I saw The Who last week! 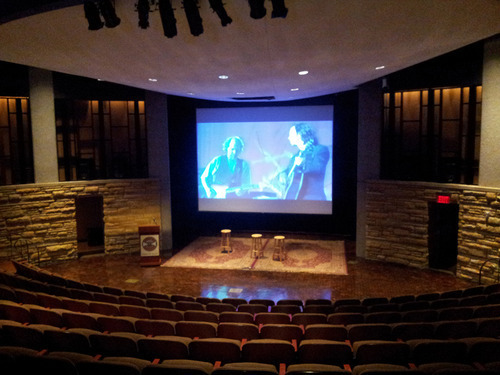 ), Gruhn Guitars, The Station Inn, Cantina Laredo and the Country Music Hall of Fame and Museum. In LA, going pretty much anywhere from my hotel involves a $30 cab ride. So with these differences in mind, and the general difference in temperament between the citizenries, I was curious before our LA premiere: How differently would the film be received? As often happens in early screenings of a film, seeing it played with an audience had given me insight into the pacing of the film. Some parts were playing slower than I had anticipated, some archival clips should be extended, some music cues held longer. Thankfully, there were a few days between the Nashville and LA screenings, so I had the opportunity to sit down at my laptop and rework the cut a little. I ended up shaving off three and a half minutes over the course of the film and the difference was remarkable. Sitting in the crowd with Jim at the Grammy Museum’s Clive Davis Theater, the film seemed to move along much faster, and the moments I’d sensed attention waning in the earlier screening now held the audience to the screen. After the film, Jim and I participated in a funny and moving Q&A (video coming soon) with Scott Goldman, Vice President of the Grammy Foundation and MusiCares. 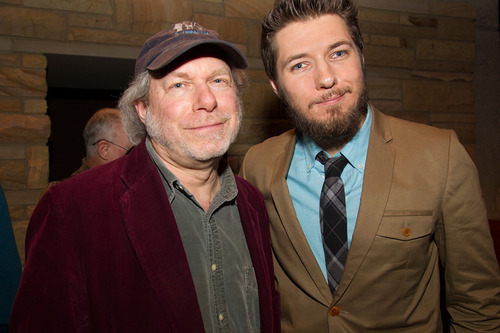 He and I were on our sartorial toes, given that we’d be sitting down the with the best dressed man in Americana music. 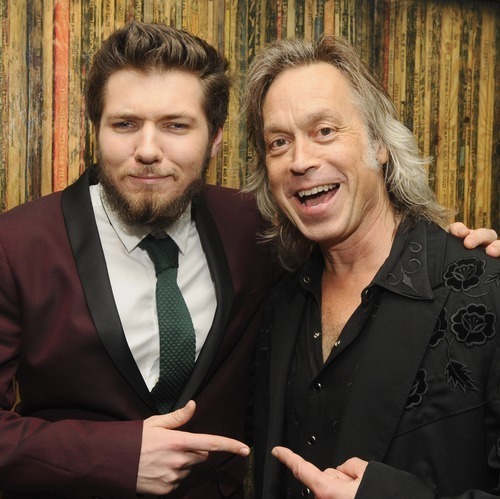 First, when Jim, talking about his 30+ year friendship with Buddy Miller, recalled the time a few years when Buddy was struck down with a heart attack and Jim feared he might lose him. He paused for a long moment in the middle of a sentence, and I could see he was fighting back tears. Secondly, a woman in the crowd began to cry as she confessed she’d been dragged along to the screening by a friend, not knowing who Jim was was. After watching the film, she’d gained a huge appreciation for his music and felt so ashamed for her ignorance of his work. And that is exactly the reason I made the film. Jim’s career has stretched over so many genres, labels, cities and years that he can go to Wilkesboro, NC for MerleFest and be treated like Neil Armstrong coming home from the moon, yet there are millions of people around the world who wouldn’t know his name. Some know the country hits that have come from his pen, but not the bluegrass albums that won him Grammys. They know his work with Elvis Costello, but not his radio show with Buddy Miller. Trying to condense Jim’s talent, generosity, humor and career into 90 minutes has been a supreme challenge, but the reactions from the people who have come along to these two screenings makes me think I captured some of his spirit. 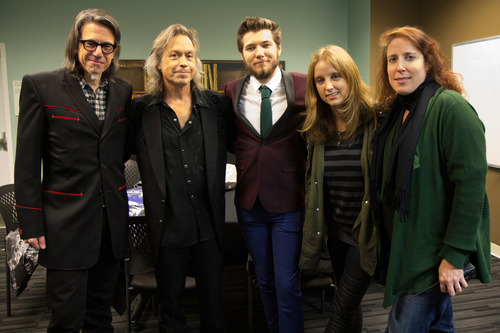 Thanks again to everybody who ventured out on a winter’s night to the Grammy Museum and to Michelle Aquilato, Lynne Sheridan, Scott Goldman and Amanda Hale-Ornelas for making this screening happen. See you all on the LauderTrail as the film makes it way to a cinema, tv network, laptop or DVD player near you! Highlights from the post-screening Q&A at our world premiere in Nashville. Jim and I are interrogated by Craig Havighurst. 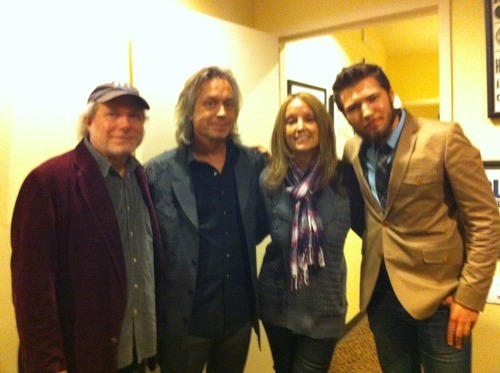 Buddy Miller, Jim Lauderdale, Michelle Aquilato and Jeremy Dylan. Backstage at Ford Theatre at the Country Music Hall of Fame and Museum. So there we go. After a few days shy of two years of work, the film premiered last Saturday in front of a mix of Americana luminaries and everyday music fans in the beautiful Ford Theatre at the Country Music Hall of Fame and Museum. It really was the world premiere too. I was tweaking the edit at 1am Saturday morning, so this was the first time that cut of the film had been screened outside of my hotel room. As I write this, I’m on a plane from Nashville to LA, making a few more tweaks before tomorrow night’s LA premiere at the Grammy Museum. I was a great experience to sit up the back of the theatre with Jim and watch his face as he saw his life played out in front of him. I never would’ve said it to him while we were making the film, but as long as he thought the film did him justice, anything else was just a cherry on top of the cake. It was also a gas watching the back of the heads of the people in the crowd who are in the film, chuckling at archival footage of themselves from throughout the past 30 years. We did a very fun post-screening Q&A with the wonderful Craig Havighurst, who has a few archival cameos in the film. Craig interrogated Jim and I on the inception of the film, some of the highlights of the production process and distribution plans going forward. We also had a few snappy questions from the crowd. There is video of the Q&A and I’ll hopefully have it up for you all to see sometime tomorrow. 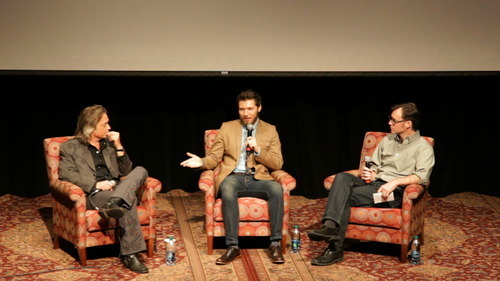 Thanks again to everyone who came out for the screening. There’s no bigger kick for a filmmaker than experiencing your work with a great audience, hearing them laugh at the funny bits or bob their head along to the music. I couldn’t think of a better place to do our world premiere either. Jim is so much a part of the fabric of Nashville and so beloved by people there. And to do it at the very museum that features some of his award trophies and outfits in one of their exhibitions – it was, in a lot of ways, perfect. So now onward and upward to the City of Angels for premiere number 2. Hope to see all you LA folks out in force for our 7.30 start. 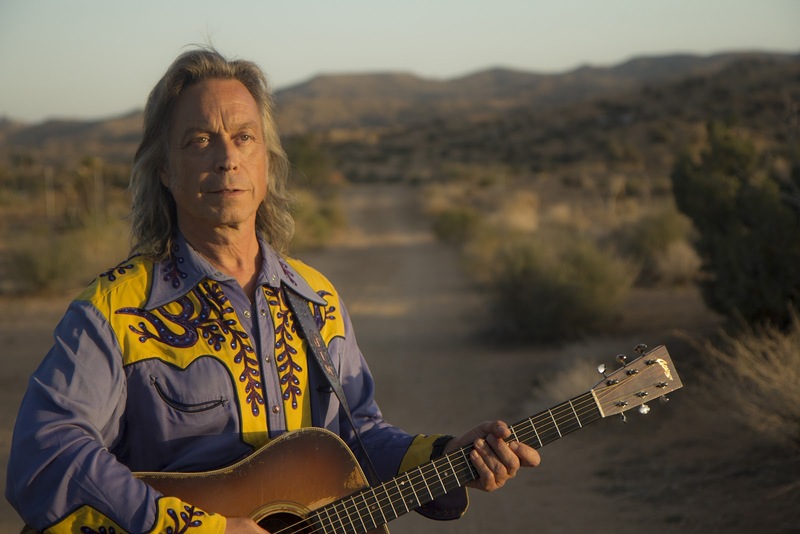 A new 90-minute documentary film chronicling the life and times of Americana icon Jim Lauderdale will premiere with two special US screenings this month – Saturday December 8 at Nashville’s Country Music Hall of Fame and Museum and Tuesday December 11 at the Grammy Museum in the L. A. Live district. Watch the trailer here. 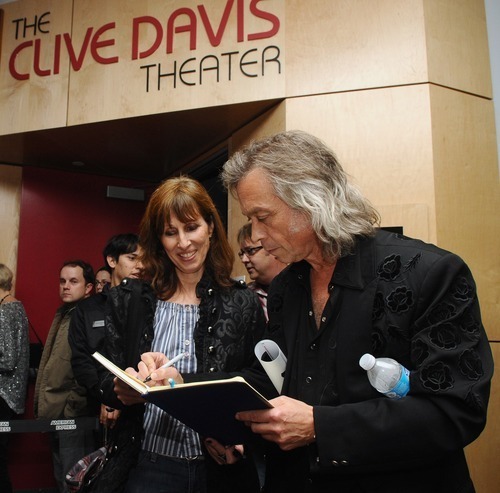 Jim Lauderdale: The King of Broken Hearts tells the story of the two-time Grammy winner from his Carolina roots, honing his chops in the 80s country scenes of NY and LA, false starts and record company frustrations, before George Strait sold six million albums with two of his songs and catapulted Jim to the A-list of Nashville songwriters, penning hits for Patty Loveless, Gary Allan, the Dixie Chicks and more. He pioneered the Americana sound and became the face of the genre, hosting the Americana Music Awards for over a decade and producing a prolific series of albums encompassing country, bluegrass, rock and soul that have won him critical acclaim and a devoted fanbase around the world. Jim’s story is told through interviews with Jim, Buddy Miller, Elvis Costello, John Oates, Rodney Crowell, Gary Allan, Tony Brown, Randy Kohrs, Sunny Sweeney, Ketch Secor and more. It also features performances with his country and bluegrass bands from the start of his career through to recent shows in the wine country of Australia and Nashville’s legendary Station Inn. The documentary was shot in iconic locations such as Nashville’s legendary RCA Studio A aka Ben’s Studio, the California desert and the 25th annual MerleFest in Wilkesboro, NC. The film is directed by Australian filmmaker Jeremy Dylan and produced by Chris Kamen and Dylan. Q&A sessions will be held at both screenings. 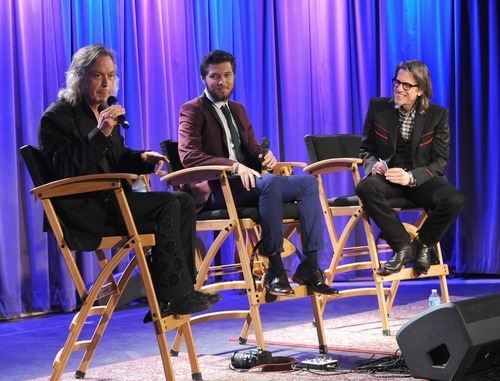 The Nashville Q&A with Lauderdale and Dylan will be moderated by journalist Craig Havighurst and the Los Angeles Q&A with Lauderdale will be moderated by Vice President of The GRAMMY Foundation and MusiCares, Scott Goldman. The screenings will cap off a busy year for Lauderdale. He released his twentieth album Carolina Moonrise in September and December will see the release of the long-awaited Buddy and Jim, a duets album with long-time friend and collaborator Buddy Miller, through New West records. Tickets for both screenings are on sale. Visit countrymusichalloffame.org and grammymuseum.org respectively to get yours now. The wonderful folks at SESAC spruiking our film. Come to our LA premiere. I will be there, so you can complain about the songs I didn’t feature in the film after the screening. Hot off the presses, the brand new trailer. Shooting wraps for the film! After a month long filming schedule crisscrossing the United States from Nashville to the California desert, shooting has wrapped on the documentary film Jim Lauderdale: The King of Broken Hearts, which tells the story of the unconventional career of the 2-time Grammy winning hit country songwriter, bluegrass singer, radio DJ, awards show host and tai chi master. After a successful fundraising campaign on IndieGoGo, which exceeded the $10,000 target by almost one thousand dollars, Australian based director Jeremy Dylan and producer Chris Kamen journeyed to Nashville in late April to begin the final leg of filming with the acclaimed singer-songwriter. The shoot encompassed interviews including pop music legends Elvis Costello and John Oates, country/Americana legend Rodney Crowell, rock’n’roll icon James Burton, producer/guitarist Pete Anderson, country music star Sunny Sweeney, Old Crow Medicine Show’s Ketch Secor, Fabulous Superlative ‘Cousin’ Kenny Vaughan and journalist/singer/songwriter/producer Peter Cooper. The filmmakers went behind the scenes with Lauderdale as he recorded a new radio show with longtime collaborator Buddy Miller, performed a marathon array of sets at the 25th Merlefest in Wilkesboro NC, wrote songs under the light of the super full moon in historic Pioneertown CA and recorded a new album in a breakneck recording session at Ben Folds‘ studio in Nashville TN with a band of ‘dream players’ that included James Burton and Al Perkins. This is the second round of filming for the project, following a trip to Nashville that director Jeremy Dylan made last June, interviewing Gary Allan, Buddy Miller, Tony Brown, Jerry Douglas, Randy Kohrs and others for the film. The film is now in post-production, with a premiere tentatively scheduled for later this year. Stay tuned to jimlauderdalemovie.com and sevenshellsmedia.com for more updates.